The club is not intended primarily for the street gamin. The growing boy in the well-to-do home and the street waif represent two distinct propositions. On this very fact, however, hinges a plan of great possibilities for the future. The central idea is to make the better ­favored class responsible for their less fortunate fellows. This, according to the new system, is not to be accomplished by a movement which entails only prohibi­tions. In the words of Mr. Crackel, the secretary of the club, it is a "do some­thing" rather than a "don't do some­thing" organization. 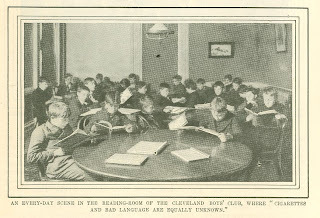 The method; by which the gamins of Cleveland are eventually to receive the attention of the members of the Boys' Club does not involve taking them into the club's home. Their needs are dis­tinct, and a special building is to be erected for them. It will be a finer and more costly one than the existing club­house. It will have highly polished floors instead of carpets, and in many ways it will be adapted to the class to be reached. It is probable that there will be no lack of money for the work, espe­cially after the present members have be come men, as many are of a class finan­cially and morally able to sustain it. In the members' descriptions of some of their trips there are incidents which show the influence of their teaching in their regard for the unfortunate street boy. 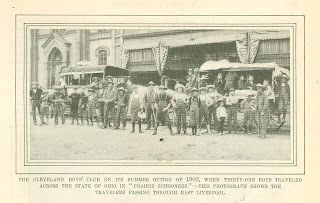 On their visit to the Pan-American Exposition, they found a lad, ragged and dirty, and with a pinched look in his face, selling papers outside the grounds. The boys asked Secretary Crackel, who was in charge of the party, if they might give the little fellow his breakfast with their own money. Mr. Crackel, de­lighted with the spontaneity of their re­quest, complimented them upon the plan, which was promptly put into ex­ecution. After the lad had washed his face, he sat down to such a feast of good things as is seldom enjoyed by a waif. Breakfast over, his ragged clothing oc­cupied the attention of his benefactors. Their next request was that they might be allowed to buy the newsboy a suit of clothes. When he was attired in a new suit his shoes were so out of harmony that the compassionate boys added foot­wear to their gifts, and then began their homeward journey with a feeling that did more to make them happy than even the best sights of the exposition. The home of the Boys Club is at the corner of Franklin and Duane Streets, Cleveland; but the work carried out here represents a much larger constituency, than those who meet beneath its roofs. This building is headquarters for the Knights of Sir Galahad. Clubs of these young knights, who sign a pledge and wear a button, taking the gallant Sir Galahad as an ideal, are to be found in many of the different schools and churches of the city. Each club sends three representatives to the cabinet meetings, which are held in the club building, and which decide upon the various contests and events open to the knights. If in winter, this may mean an exhibition in which hundreds will compete in the making of models or inventions. The boys also draw, paint, collect stamps, carve wood, write stories, play the piano, and deliver orations. The annual outing of the Boys' Club proper is the feature which has attracted the greatest attention. In 1898, before the present home of the club was in ex­istence, the lads, under the direction of the secretary, made their initial trip to Niagara Falls. 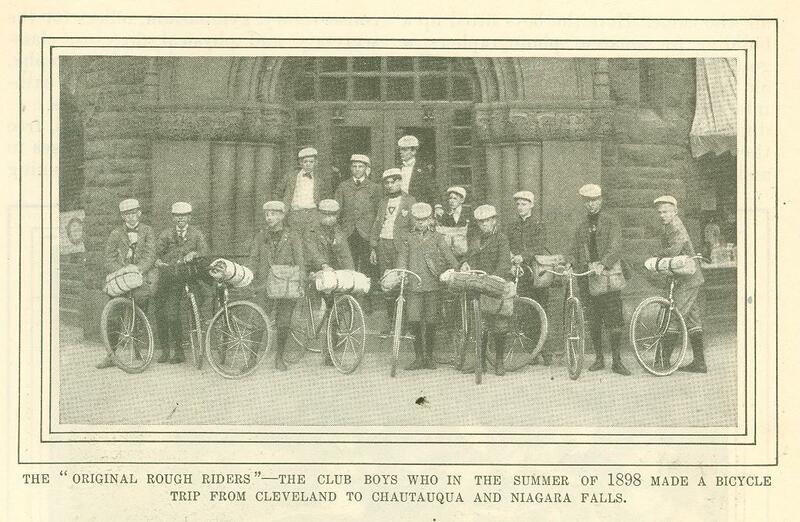 The Rough Riders, as they were called, made the journey upon bicycles. 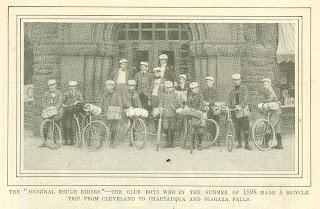 On their way they visited Chautauqua, and at the Falls they were the first party allowed to camp upon the New York State reservation. Many sig­nal kindnesses have been shown the young travelers from time to time when upon their tours. The following summer, the outing party went to Mackinac Island, where the boys were permitted by the govern­ment officials to use the historic fort. They made the acquaintance of the French Canadian Indians, wore Indian costumes - a rare treat, of course, for the average American youngster - and played Robinson Crusoe on an uninhab­ited island. During the vacation season of 1900, thirty-three of the boys went down the St. Lawrence River to Montreal. On this trip they were introduced to the mayor of Toronto, who gave them the keys of the city. They shot the Lachine rapids. and halted at the most interesting points along their route. Two parties attended the Pan-American Exposition at Buf­falo, in the following summer. 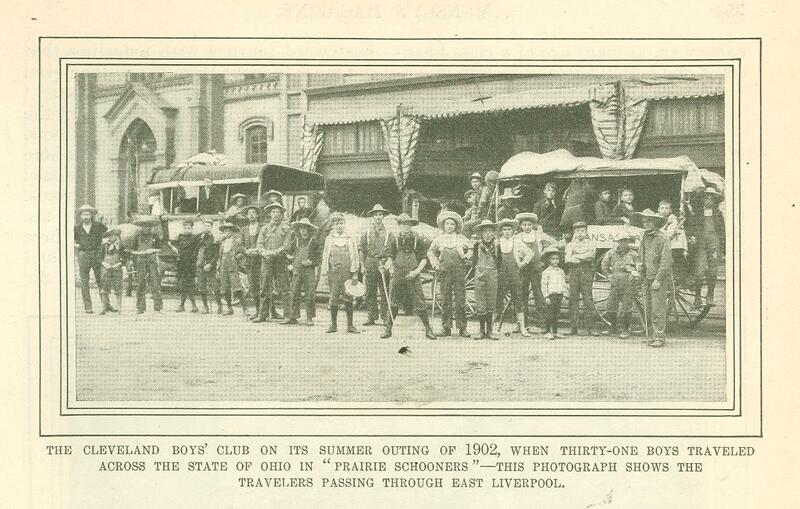 But the most notable and successful trip of all was made in 1902, when thirty-one boys in covered wagons, which they chose to call "prairie schooners," made a tour across Ohio. They traveled two hundred and twenty-seven miles, and were away from Cleveland two weeks. They visited the old village of the Zoarites and the great potteries at East Liverpool; they saw President McKinley's grave, and were greeted by Mrs. McKinley on the famous front porch of her Canton homestead. They set foot on the soil of Pennsylvania and West Virginia, and filled a bottle with water from the Ohio River, to empty it into Lake Erie on ar­riving at home. The boys traveled from twenty to thirty miles a day, camping in the open air at night. Some of them walked most of the distance. Those who preferred riding were known as the "lazy duffers." 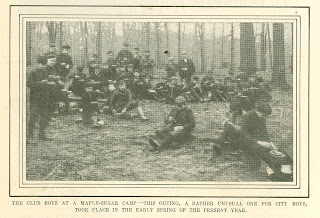 After returning from the gipsy trip, the members of the band went into camp at the"reservation." This was a forty ­acre farm, about twenty miles from the city, which had been leased by the club. Parts of the tract were deeply wooded, and through it there extended a trail leading to a small river, on which there were picturesque waterfalls. Rustic bridges crossed the stream; fish abound­ed, and there were boats sufficient for all who came. Here the boys fitted up a building for amateur photographers, a golf course, and tennis grounds. The old buildings on the farm were turned into sleeping-quarters, and there was a dining-hall, with a cook employed by the boys, each one paying two dollars and fifty cents a week for his board. Under a manual training teacher they learned to make boats. Forty boys, of the total membership of four hundred, could be accommodated on the reserva­tion at one time. 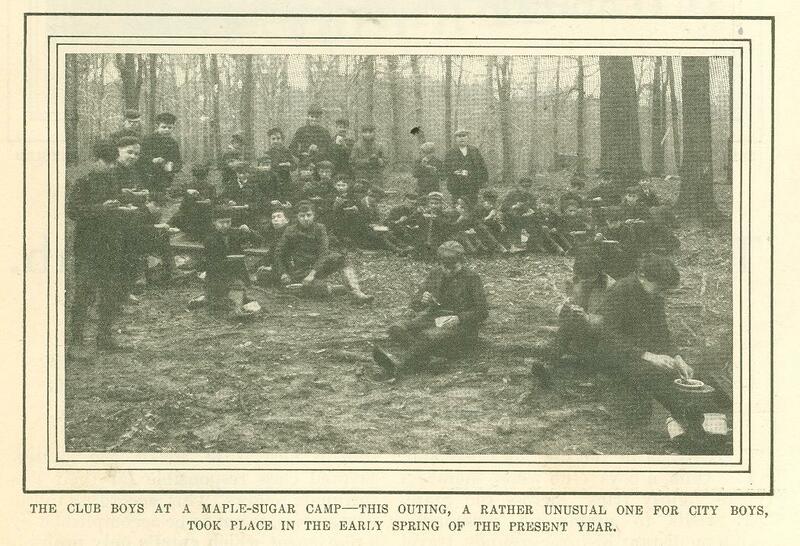 Last spring the younger boys had an early outing in the woods at maple­ sugar time, and ate warm sugar in the midst of a real sugar camp. Later, in July, a camp was established on the Rocky River, at Albion, Ohio, where fifty could be accommodated each suc­cessive week. Here they have lived in tents, and have had ample facilities for bathing and boating. The club-house will accommodate five hundred members. Within six weeks after the building was opened, there was a membership of three hundred. It includes a workshop, a reception room, a reading-room, two amusement rooms, conservatory, gymnasium, offices for the secretary and physical director, class­rooms, dark-room for photography, wheel-room, boiler-room, kitchen, bath­rooms, swimming-pool, and lockers. There are entertainment courses, free literature, lectures, and Bible classes in the busy life of the Boys' Club. Evening classes are organized for the benefit of members employed during the day. Cigarettes and bad language are equally unknown in the club buildings. Military obedience to the secretary of the institution in matters of sleeping, eating, and exercise, when away from the boys' homes, is obligatory. 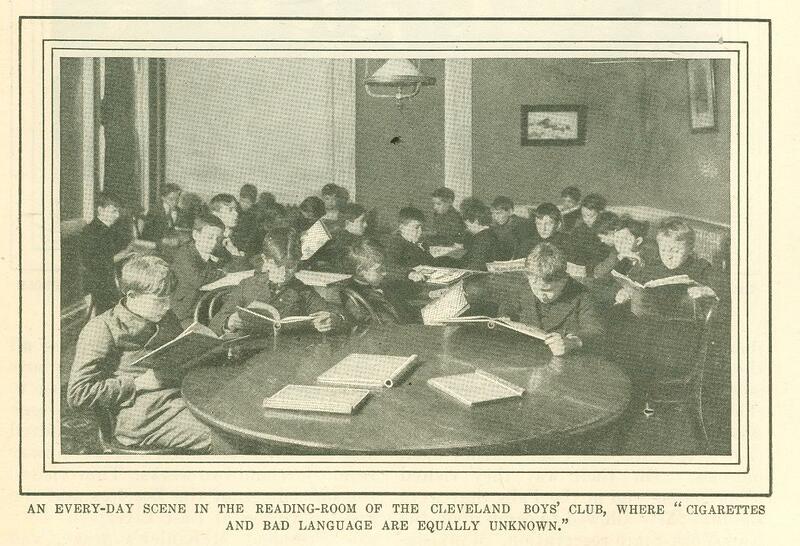 The child is father to the man, and the Cleveland Boys' Club aims to pro­duce good American citizens. ­Originally published in Munsey's Magazine. December 1903.